ValuMAX Red Tube is highly effective against tapeworms, large strongyles (bloodworm), small strongyles (red worm), ascarids (roundworms), pinworms, hairworms, stomach worms, intestinal threadworms, neck threadworms, lungworms and bots. A reduction in the prevalence of associated colic could be expected. 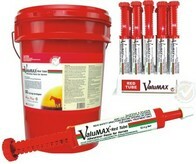 ValuMAX Red Tube is also effective for the control of skin lesions caused by Habronema and Draschia spp. cutaneous larvae (summer sores) and Onchocerca spp, microfilariae (cutaneous onchocerciasis).